Today I went outside the courtyard. Today I went into the streets. Today I walked and walked and walked. Today I fell in love with Mexico all over again. Today I began a love affair with San Miguel. It's been over 20 years since I've been to Mexico. The love of my life and I spent many winter getaways in this beautiful country. We both fell in love with it. At one point, we nearly moved to Puerto Vallarta. In addition to PV, I've spent time in Mexico City, Cuernevaca, Taxco, Acapulco, Merida, Progresso, Cozumel, and a two week period of time on a Mexican fishing boat in the Gulf of Mexico on a diving expedition at Scorpian Reef. I've never been to San Miguel. I've always wanted to come here. Guess what? Here I am. Flying Solo. The one big concern I have about flying solo is .... who do you share things with? Who do I gasp in delight to ... who's hand do I squeeze when my body is so tight with excitement I cannot speak? That's the part I miss. Sharing with someone. No one there to discuss things with, share opinions, or have wonderfully heated philosophical debates with. Me, myself and I just are not the same. Nevertheless, here I am flying solo, and I am absolutely determined to love it ... to appreciate it ... to find every good thing I can in it ... and to be alone without being lonely. After all, as I have said before, this is one of my life lessons. So having whined about all that, let me tell you the good news. There is ART at every turn, colour abounds, texture and design in every form is around every corner. I stepped over it, so I didn't trip on it. I inhaled it, I swallowed it, I allowed it to lay in my belly and absorb into my cells. I came home completely full, completely satisfied, and wanting more and more and more. Will I ever get enough. I longed for the textiles, for the pottery, for the leather, for the shoes, the flowers, for the hand made jewelery, for the art. Everything I saw, I wanted to scoop up and and gather around me. Like a treasure hunter, I wanted to hold it near, simply for the sake of holding it near. I wanted to decorate a new abode. I am not a shopper. I didn't think I wanted any more 'stuff'. Perhaps I was simply bored. I felt 'at home' today. At home in old Mexico. As I was walking I fell upon a little 'hole in the wall'. A vendor, cooking pork. All kinds of pork. He had a huge basket of pork rinds ... very popular here. I couldn't resist the ribs. They are almost like chops they have so much meat on them. I picked out a huge chunk and brought it home. That's what I am feasting on tonight. Pork, fresh ripe avocado and tomato wrapped in a tortilla. YUM! Architecture has always interested me. 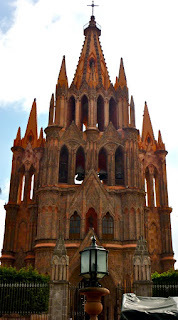 Mexican architecture is no exception. Spanish colonial with the strong influence of the Moors. Incredible. I can't take my eyes of the doors and windows. I take photo after photo. Younger, more nimble Mexican woman pass me, high heals clicking on the cobblestone. It's a miracle I think to myself. I wobble, making sure I have my foot in the right place, stumble and cling to walls, making my way while trying not to gawk and walk. Thank God for my crocs! I found a door today which was really interesting. Someone had been doing math on it in chalk. I thought it was 'cool'. 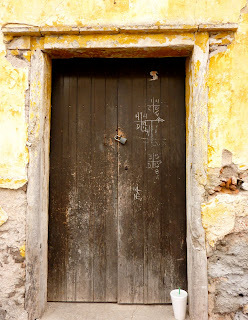 I know there is a book out called 'The Doors of San Miguel". 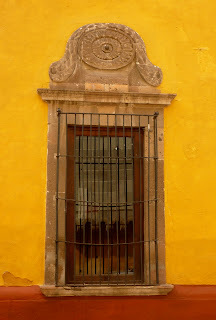 These however, are 'My Doors of San Miguel". I've always coveted windows and doors. One gentleman said to me, "Perhaps you were a carpenter in a previous life". Perhaps I was. Well, m'dears, I will no doubt continue this saga tomorrow. I've had the most wonderful of days. I am so very grateful.